the image analysis and data assimilation issues related to coupling/fusion of anatomical models with imaging data of tissue properties (eg X-rays, US, CT, MRI, PET, SPECT, optical imaging etc). The ERCIM WG on the Digital Patient intends to promote interaction between the relevant ERCIM R&D groups, and to facilitate cross-fertilization and synergistic activities in collaboration with other groups and initiatives such as the Europhysiome initiative currently funded by the European Commission. Cardiovascular modelling is important for the therapy planning and guidance of cardiovascular therapies. An example is Atrial and Ventricular Radio-Frequency ablation for the surgical treatment of atrial/ventricular flutters or fibrillations. The therapy consists of burning cardiac cells that are causing pathological electrical pathways. Prior to burning the cardiac tissue, the cardiologist must precisely locate the pathological cardiac cells by reading electrical signals measured by more than ten electrodes inserted through an endovascular procedure. The real-time interpretation of those signals requires significant training, and the planning and execution of the therapy could be made more efficient with the use of electrophysiological models. Another important example is Cardiac Resynchronization Therapy. Resynchronization therapy artificially stimulates the myocardium through implanted electrodes in order to limit the ventricular dysfunction caused by asynchronous ventricular contraction. Although a number of cardiac resynchronization therapeutic strategies exist (regarding the selection of the number, location and delay between those electrodes), nearly 30% show no real improvement in cardiac function. It is therefore plausible that a thorough planning of CRT based on a personalized cardiac model could greatly assist the cardiologist in deciding the optimal strategy. 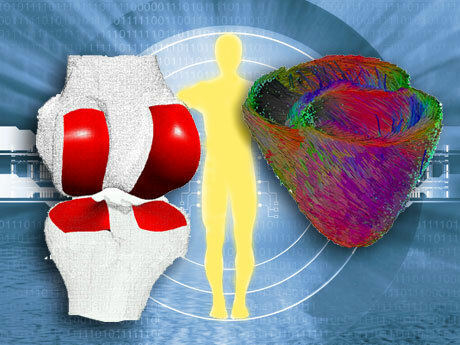 Musculoskeletal modelling aims to predict musculoskeletal behaviour (eg bone kinematics, tissue deformation, tissue degeneration and tissue reconstruction) from the morphology, kinematical constraints, mechanical constraints or neuromuscular impulses. In addition to applications in orthopaedics (eg early detection of osteoarthritis, prosthesis design, osteotomy planning, tendon lengthening and ligament reconstruction), this would be of use in kinesiology for movement optimization (eg reduction of tennis elbow), rehabilitation and ergonomics (eg minimization of physical fatigue under specific constraints). From the physiological point of view, a link between large-scale studies (anatomy-based virtual humans animated from motion capture and EMG) and small-scale studies (deformation analysis due to local fibre actuation) has not yet been achieved. Bridging those domains through computationally efficient and scalable mechanical simulation methods is a major challenge. Oncology modelling focuses on the simulation of tumour growth and/or the response of tumours and physiological tissues to different therapeutic regimes (eg chemotherapy, radiotherapy or combined therapy). In this way, the optimal therapy decision for individual patients can be selected on the basis of the best simulated therapy outcome. For this to be successful, it is crucial to test these models against reality and thus assess their usefulness in clinical practice. From a purely technical perspective, the challenges include: the development/refinement of a number of hybrid discrete Monte Carlo/cellular automata and continuous differential equation simulation models of normal tumour growth and response to therapeutic modalities; image analysis tools such as geometrical normalization (eg 3D MRI before and after therapy); extraction of relevant information (eg accurate tumour delineation also considering liquefaction during therapy); normalization and quantification from images (eg differential gene expression, tissue density); and visualization. The main clinical applications are glioma and nephroblastoma (Wilms tumour). These applications have been selected on the basis of existing work, experience and ongoing clinical collaborations in relevant projects. The ultimate goal is to optimize the therapeutic strategy by conducting, in a patient-specific setting, in silico experiments on tumour growth and tumour and normal tissue response to therapeutic schemes. This wide range of research interests was the inspiration behind the proposal for a special theme on the Digital Patient for ERCIM News. This issue features articles addressing either European projects or specific scientific achievements related to the VPH. A number of articles deal with applications of 'Pathophysiology modelling' (at the organ level), mainly in the three areas previously described. However, in order to build multidimensional models of the human function, it is essential to extract information from all possible scales. This is addressed by articles on the subtopic 'Data analysis and imaging' in this special theme. Several articles address 'System biology modelling', since modelling at smaller scales (cellular and even molecular) is an essential part of a 'holistic' VPH. Lastly, the article by Vincent Duffy deals with Digital Human Modelling for perception-based safety design.